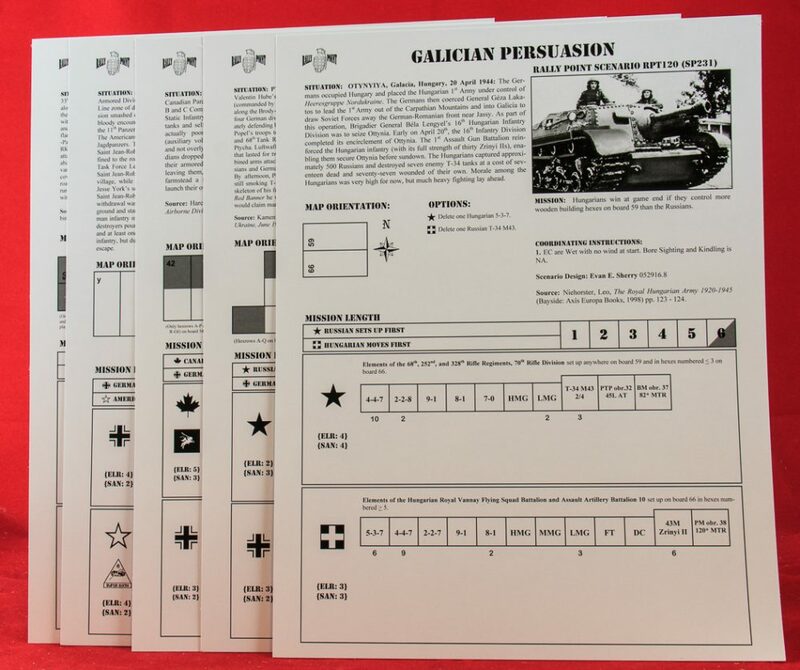 10 (reprint) scenarios on cardstock, 2 pages scenario notes. 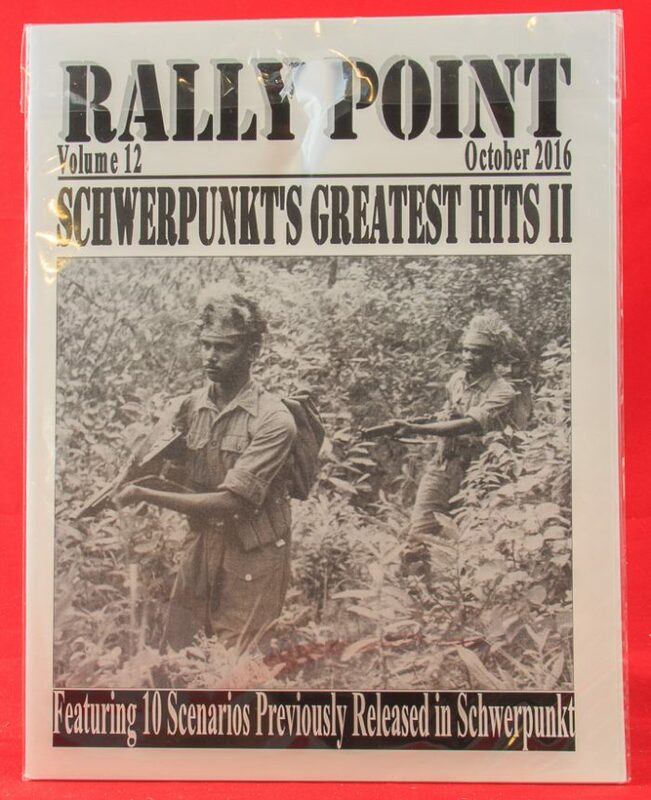 At ASLOK 2016, Schwerpunkt released its normal issue of Schwerpunkt, a Rally Point scenario pack, and this second Rally Point scenario pack, a reprint pack dubbed Schwerpunkt’s Greatest Hits II. 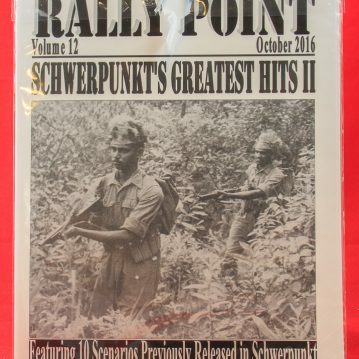 Publisher Evan Sherry took one scenario each from Schwerpunkt volumes 11-20 to form this reprint pack. Thus the pack does not necessarily consist of the best scenarios from that era, but merely the best scenario from each issue. Best, of course, is in the eye of Schwerpunkt. Most ASLers who buy Schwerpunkt products will already have these scenarios. Evan Sherry suggests that the pack is intended for “players who may not have been able to acquire” volumes 11-20, but all of those issues are readily available inexpensively from online retailers. The only practical purpose this product serves the ASL consumer is as a “sampler platter” for someone who has not tried Schwerpunkt at all and wishes to see if they might like it. It might also suit someone who is not particularly enamored of Schwerpunkt scenarios in general but wouldn’t mind getting a compilation of some of their better scenarios. These are limited audiences. All of the selected scenarios were designed by Evan Sherry. Actions depicted occur in a variety of World War II settings, including Burma 1944; Romania 1944; France 1940 & 1944 (2 scenarios); Soviet Union 1941 & 1943; and Hungary 1945 (2 scenarios). This mix also reflects the general predilection of Schwerpunkt for ETO scenarios as well as its emphasis on 1944-45 scenarios. The scenarios chosen are, with one exception, well-balanced and, again with one exception, fairly popular. 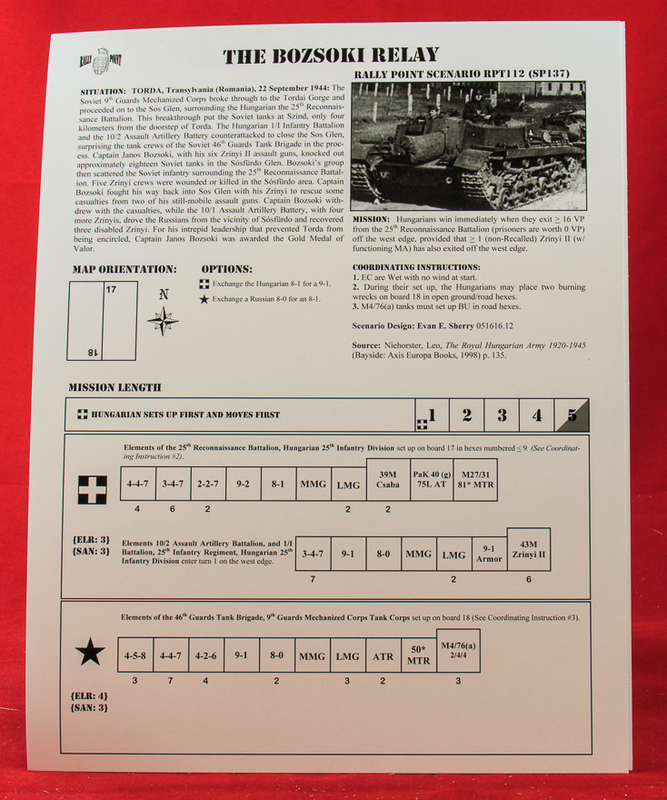 The two exceptions are RPT114 (The Fond Dago Drag-Out), originally SP158, which is one of the less-played scenarios of that Schwerpunkt volume, and RPT118 (Mius Mischief), originally SP205, which ROAR suggests is not very well-balanced. Many might argue about scenarios omitted from the pack, including what is by far the most popular scenario of Volume 11, SP125 (Nunshigan), as well as the most popular scenario from Volume 13, SP154 (On the Road to Hell). Other notable omissions include two from Volume 17: SP202 (Fiery Finale) and SP204 (Yankee Pride). To play all the scenarios, the following boards are required: 2, 3, 6, 17, 18, 32, 42, 43, 44, 50, 54, 59, 62, 65, 66, 1a, 2a, 5a, and y. The scenarios tend to the large in size; more than half are large, a few are medium-sized, and only one is small. One scenario has OBA; no scenarios use Night or Air Support rules. The SSR and VC of all the scenarios are short and to the point. As is common with Schwerpunkt offerings, the scenarios tend towards having lots of AFVs. For someone who hasn’t tried Schwerpunkt, this is as good a place as any to start, as the scenarios here are all tried and true. For a Schwerpunkt regular, this offers nothing new.